January 2019 saw the release of the Deco Diamonds slot at Microgaming casino sites. Although released by Microgaming, Deco Diamonds was actually developed by another studio called Just for the Win, which is gradually building a relationship as a software partner. The name Deco Diamonds is indicative of the visual design philosophy, which is underpinned by the art deco movement. 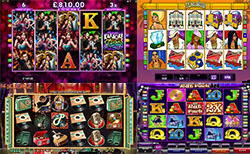 Just to summarise, this is driven by an embrace of geometric patterns and bold colours, and those qualities are very much on display in this slot game. Moving on to the technical aspects, Just for the Win has built Deco Diamonds as a five-reel slot with three rows. Meanwhile, the control buttons are placed vertically to the right of the screen, so as to allow for the entire slot to be optimised for desktop and mobile devices. The chip button can be used to adjust the wagering value within the range of €0.10 to €0.50. Once the reels are spinning, it is then possible to gather up winnings by combining symbols along the nine paylines. The biggest target would have to be five Deco Diamonds symbols, as that combination will trigger a 1,000x multiplier. Deco Diamonds is quite a focused experience in that you will not be taken out of the gameplay to pursue any story elements. • Deco Diamonds wild symbols: these have the capacity to trigger re-spins and to also lock any reels with wild symbols in place. • Deco Diamonds bonus wheel: landing three Deco Diamonds symbol will open up the bonus wheel mini-game. Three symbols open the silver level, four open the fold level, and five open the diamond level for even higher multipliers to play for. To sum up Deco Diamonds, the slot is visually strong and performs well on most types of devices. Meanwhile, the slot eschews story in favour of gameplay, which is supported by the multi-functional purposes of the Deco Diamonds wild symbols. The fact that you can re-spins, lock wheels, and trigger a bonus wheel are reasons enough to play the slot.